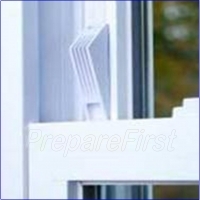 Helps prevent windows from being opened more than a safe amount for children. Easy installation with with adhesive Velcro strips. No screws or suction cups. For child safety, it is recommended any window be permitted to open more than 4 inches. NOTE: THIS PRODUCT IS ITEM PK612W WHICH IS BEING PHASED OUT BY THE MANUFACTURER. THE REPLACEMENT ITEM PK612SRW WILL BE AVAILABLE SOON ON OUR SITE AND WILL BE PRICED AT $11.99.